I have been lucky enough to actually see the fantastic world of Hambly Screen Prints first-hand, as they are located in the San Francisco South Bay Area. I've gotten more than one tour, and almost had to be dragged out of the factory by my ankles, as I scrabbled at the floor, so great was my desire to move in permanently. Alas, I had to leave. And I had to move to Boston. So I was thrilled to receive a care package including a little bit of California love, courtesy of Hambly. -That Hambly smell (did you know they add vanilla to the ink to make it smell dee-lish?). -The unbeatable color palette. The turquoise is the perfect shade, the pink is not too pale and not too bright... it's all gorgeous. -The quality. The overlays are heavy, with the ink laid down with just the right amount to keep each individual design clear and smear-less, no matter how intricate. -The variety. There truly is something for everyone in this latest release. -The larger patterns are hard for me to use. I end up cutting them down and using bits and pieces here and there, or turning them over and using the backside. Supplies: Pink overlay, patterned paper (Hambly), jewels (Kaiser Craft), ribbons (various), alphabet stickers (Doodlebug Designs), mini-clipboard (unknown). What do you think? Do you love them? Or are you just movin on? Let us know and you will be entered to win a fun prize from Hambly Screen Prints! YAY!! I love that aqua sheet! I don't know if it would be hard to use until I would have it in front of me, but I thank you for the chance to win! I think your projects turned out beautifully! I have a hard time with the larger transparencies as well but love their stickers! Gorgeous projects. The turquoise feathers is my favorite. The colors are really nice. I have used a few of their overlays and they are a very high quality. I feel dumb, lol, never thought to use pieces of them if the pattern was too busy. Now I can buy those that I loved but didn't know how to use. Thanks for the great review. Love Hambly!! That turquoise is gorgeous. Thanks for the chance. I'm a believer! Love Hambly in all its forms and amazing colors and designs! Thanks for the opportunity! Great colors, I would love to work with this!! Hambly is definetely one of my favourite producers! My all time favourite are the kraft stickers (especially the ones with owls and birds... And the ones with chandeliers...). I agree with you that the papers and overlays with big patterns is a bit hard to work with, but luckily you can fin tons of great inspiration at their blog. Love their design team! Love what you made with your Hambly supplies, especially the mini clipboard (SO cute!) and the love card with butterflies. Love your projects. Love all that tourquoise also. Don't forget, their rubons are fantastic too!! I have not used them. Thanks for the review and a chance to try some. I love Hambly products...so cool to see some new ones (that teal peacock looking design rocks!) .. and your projects are FAB-O!!! I didn't know about the vanilla (now I have to go home and sniff my Hambly stash!). I LOVE Hambly! They are one of my favorite manufactures. I especially love their rub-ons! These are such cute projects! 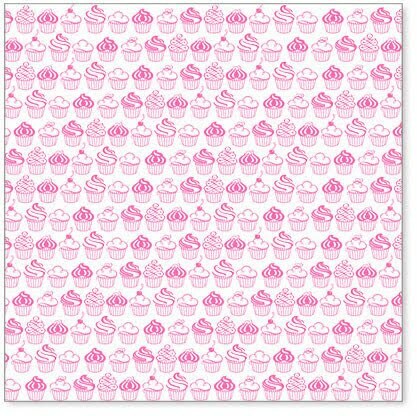 I am totally loving that cupcake sheet! I haven't tried them yet, but have looked at what little my LSS carries. Didn't know that about the vanilla! I love these cupcakes! So cute! oh my goodness, i am in LOVE with Hambly. their overlays are FABULOUS, and i'm all about their rubons lately. YUMMY stuff, and the ones you've shown us here are just gorgeous! amazing projects! I didn't know they added vanilla scent to the ink - very cool. I definatly need to pick some up, can you get it in Canada?? I totally want smelly paper.LOL Thanks for the chance to win! Vanilla in the ink?? CRAZY! I have been lucky enough to have found Hambly early on. This company is amazing! They have not scrimped on the quality. I can't say enough about them. Other than...more!! I have never used Hambly products. I LOVE the colors and patterns of the papers shown. Cool idea putting vanilla in the ink!! Love the colors and patterns; hate the price. hambly has been one of my all-time favorite manufacturers. their prints and overlays are timeless classics that i can always count on and never seem to go out of scrap-style. I love their stuff. I have been using them for years and always love the new designs they come up with. I'd love to try them, thanks for the opportunity! I have never heard of Hambly but I definitely like what I see. I LOVE that turquoise colour and how fun would it be to stamp with vanilla scented ink...my favourite scent...hope I win! Lain, These look beautiful, I have not seen them in real life though. I am doing your LOAD, and I am seeing your name all over the place on my blog hops. Thanks for a chance to win. I like what you made, the turquoise! I would really like to try it myself. Thanks for the chance to win. I was in my LSS last week looking for Hambly product - was very sad to find only three transparencies! Love their stuff and the vanilla idea is cool! Printers' ink smells! I love the turquoise....Hambly does have GREAT patterns and colors. Only problem.....I want them ALL!!! i love how the hambly prints can add that extra OOMPH in any project/layout. ur samples are so pretty! love the mix of colors and texture! thanks for the chance! Hambly products so totally ROCK! I love the turquoise also. Thanks for the opportunity to win! Wow! Your projects are amazing! I love the clipboard! I've never tried any Hambley products but I'm curious to try them after seeing your projects and reading that they are scented with vanilla - yum! Thanks for the chance to try out some new goodies! I just love the little cupcakes and the beautiful turquoise ink. Thanks for the chance to win. 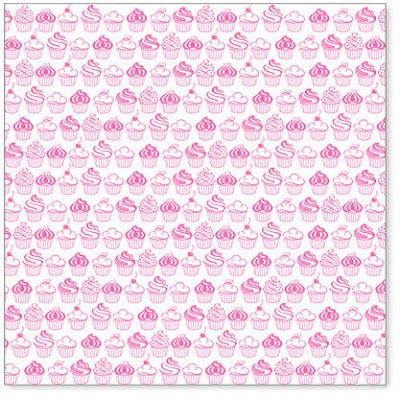 The cupcake paper is pretty. I have never seen Hambley before and I just love love the papers and the projects you did especially the cards came out Fine. I will have to try the Hambley line just to get the smell you so aptly described. Thank you for sharing. Love Hambly Prints! I like to use small pieces of transparencies on my layouts. Love Hambley's overlays. I have quite a few and I always buy more than I need so that I don't ever run out. Thanks so much for the chance to win. Love Hambly - the smell, prints (large and small) and quality are all wonderful!! I have a hard time using overlays. I never know quite what to do with them. Your examples have given me some good ideas. Love their transperancies in mini albums. Love, love, love Hambly!!!!! I think I bought up all the different colours the cupcake pattern comes in because it's so adorable. Hambly overlays have been up there at the top of my favourites list for years! The quality and designs just get better and better! Plus they can be used anywhere, from layouts, to cards, to Off The Page projects! I've only used Hambly's overlays a couple of times...and both times they were for small prints/frames. Thanks for the chance to try out some of Hambly's product! what awesome overlays! I just love hambly!! Hanbly is so unique and interesting, love it. LoVE them. The cupcakes are GREAT!! I really love Hambly's products especially the transparencies. Through the years my favorites have been the chandelier rub-ons and all the woodgrain products. I also really enjoy the vanilla scent! i love all hambly but have yet to get my hands on those cupcakes!!!!!!!!!!! great projects you have here too! thanks for the chance to win!!!! I think I like this, I have never played with Hambly products before. Love the peacock feather overlay. I'm not terribly familiar with them so this was good info. I love just looking at the Hambly overlays, but I have to admit that I never really could figure out how to use them!?! Your examples opened my eyes to the possibilities, and I would love a chance to get my hands (scissors?) on some of these! I love hambly overlays..great patterns & colors! I tend to use bits & pieces as well..need to try and use the whole sheet more often! You gotta love a company that can do pretty and cute, too. Just what I need, more temptation, thanks Lain! I just saw these prints at a local store and decided they were amazing. I love what you did with them. My hardest thing is deciding what to do with a new product. But these are really beautiful! I'd like to put them on my wall! Ha! Thanks so much! I love Hambly as well. 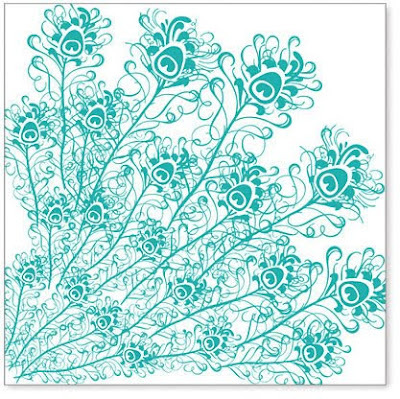 The aqua feather sheet is fantastic and I love the card you made with it...perfect! Did not know about the vanilla scent, very cool. I had no idea about vanilla being added to the ink. I'd love to try these out a bit more, I always struggle a bit with overlays. I am never, ever going to be over transparencies. And Hambly's are awesome! I like looking at the overlay, but never knew how to use them. I love how you cut them up into smaller strips and pieces! That looks totally do-able for me. I love the Hambly it is very pretty! I love your projects. The colors are fabulous. I am so in love with Hambly that I'm afraid to use it for fear it will go away! lol I did use some rub-ons and when I went looking for more of the same I couldn't find them. BoooHoooo! I have had a few Hambly overlays and really had fun with them. I need that cupcake one you showed!!! You have me curious about the smell now, I need to do a sniff test! I love Hambly!! I've only used their rubons so I would love a chance to work with these awesome overlays. I LOVE the peacock print!! love, love, love Hambly! My only problem is that I love their products so much that I don't want to use them- sometimes it turns into a hoarding issue! LOL! Thank you for the opportunity to win some Hambly goodness!!! Love Hambley! They have such unique and cool stuff.